Day 3 I ate it as a salad with chicken breast and a small amount of ranch dressing.♥♥♥ All of these lunches were delicious and very satisfying! Starting with the first 2 ingredients as your base add the rest of the ingredients in amounts that please you. Try it sometime, I think you will LOVE it! I know I did! Make sure you stop in here for a Giveaway! Mmmm...your Black Bean and Avocado Salsa looks and sounds soooo yummy! I would love it! Thanks for sharing the recipe with us...I'll have to give it a try! I just wanted to stop by to say thank you for your recent visit! I sooo enjoyed your sweet note, my friend! Thank you! Oh heavens yum! I absolutely love salsa and chips. Hubby makes homemade salsa often so we'll have to try this. I also use left over salsa on my chicken! I would be delighted to have you stop by and link this up to my VIP party this weekend! http://designergarden.blogspot.com/2011/10/vip-party-34.html Have a safe and happy halloween! Handy to have this kind of recipe. You've changed it up so well. 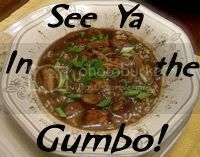 Thanks for linking w/ See Ya In the Gumbo. Lovely recipe - i especially like the look of that burrito! Oh, I love variations on salsa (I found a mango one ages ago that I loved). This one sounds so good!